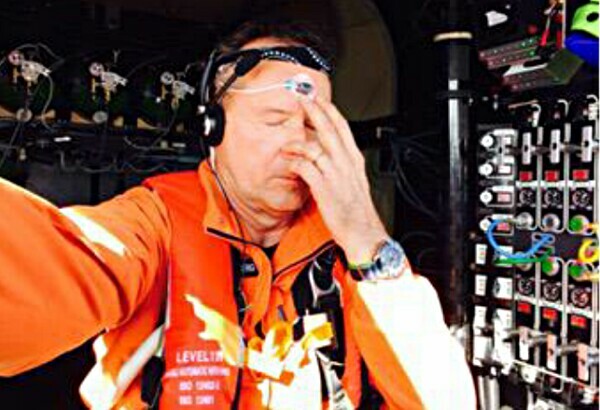 While flying around the world in a solar plane, Solar Impulse 2 Pilot Andre Borschberg relates, “Though the cockpit is not big enough, I still do yoga and meditation to keep fit, aware and awake.” Then, taking off once again in the Solar Impulse 2 (Si2), Andre Borschberg piloted the innovative solar plane on the next stage of its historic Round the World (#RTW) fuel-free journey. Departing Ahmedabad, India, on Wednesday, March 18, the relatively short flight to India took 13 hours. Although the stopover in Varanasi was very short, this famous Hindu city holds special importance in the lives of the yoga-practicioning pilots, Solar Impulse CEO Andre Borschberg, and Solar Impulse President Bertrand Piccard. 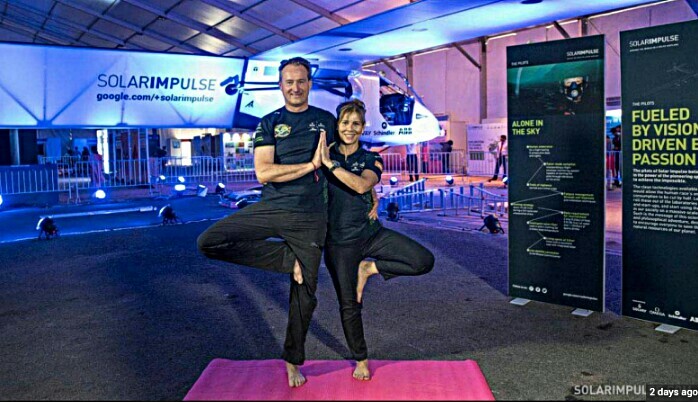 Both Andre Borschberg and co-pilot Bertrand Piccard rely on the spiritual practices of yoga, meditation, and breathing exercises, or pranayam to support their physically challenging endeavor to circumnavigate the earth in the tight confines of a single-seater solar airplane. According to Huffington Post, the two have been practising yoga under the guidance of Indian yoga guru Sanjeev Bhanot for the past 12 years. After a fond farewell for Varanasi, India, Bertrand Piccard took his turn in the pilot seat of the Solar Impulse 2. 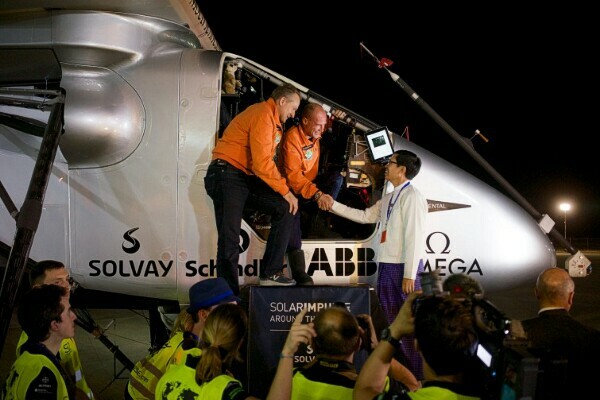 Taking off on March 19, Piccard completed the 1,400-kilometer flight to Mandalay, Myanmar in 13 hours and 29 minutes, flying only on energy generated from the sun. The Solar Impulse 2 crew, with its team of ABB engineers, was ready for the Si2 with their inflatable hangar set up. Co-pilot Borschberg was standing by, and all were greeted with a very warm welcome as Pilot Bertrand Piccard opened the cockpit door in Mandaly. 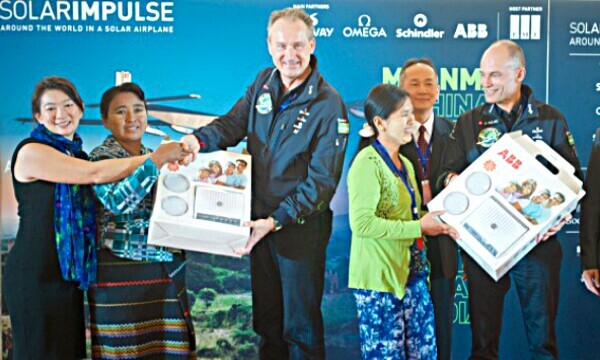 On the following day, Piccard and Borschberg presented ABB solar battery charging units to remote village residents. ABB has been bringing electrical power and educational and economic opportunities to developing countries for over 15 years in its “Access to Electricity” program. Now, working with local NGO partner Pact Myanmar, ABB is helping to ensure that over 3,000 people can now access stable, renewable energy in 10 of Myanmar’s remote villages. The Solar Impulse 2 will continue on to China next. Stay tuned for another update soon!